Irtiqa: Science & Religion in "Knowing"
Yes, Knowing got panned by virtually all critics (34% at Rottentomatoes). And yes, it has Nicholas Cage in the lead. But I went to see it any ways for two reasons: 1) Roger Ebert considered Knowing "among the best science fiction films" he has seen - he usually knows what he is talking about, and 2) it is directed by Alex Proyas, who earlier did Dark City - a beautiful and fantastic film from 1998 (unfortunately, Proyas also did the horrendous I, Robot). So Ebert's reputation was clearly on the line. Well, I'm glad to report that my time was not wasted and Knowing turned out to be a very good film. 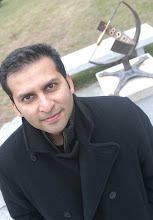 Plus, there is ample material to talk about science & religion - in particular about determinism and randomness, if there is a purpose to the universe, and the benefits and pitfalls of competing ways of knowing: science and religion. If you are interested in checking out the film, don't read further. In fact, I'm not even embedding its trailer here - it gives away too much of the plot (If you are planning on seeing the film, ignore these articles, otherwise, here is Ebert's review of Knowing, his analysis of the film, and his guess as to why most critics hated Knowing). Fundamentally, the movie is about causal determinism. Unfortunately, at one of the key discussions, it conflates determinism with purpose and randomness with chance. But you can have a completely deterministic universe without any purpose. For the most part Knowing takes the view of a deterministic universe with no purpose (crap just happens...). However, with a complete (??) knowledge of physical laws, one can potentially have information about what is going to happen. And that is the premise of the film. Someone has that knowledge - and they are either aliens or angels (depends on one's perspective - and there is much disagreement on this point). To me, the semi-mechanistic nature of their space ship points towards them being aliens more than angels. The distinction, however, can get murky and Shermer's Last Law sums it up perfectly: Any sufficiently extraterrestrial intelligence is indistinguishable from God. The underlying question in the movie, of course, is whether humans really have a choice (the question of free-will --- nooooo!). My interpretation of the ending suggests - no, not really. All of the accidents that were predicted to happen - happened. In fact, even the prediction of the end of the world literally came true (very cool!). In this scenario, even the foreknowledge of events could not change a thing. But then what about the alien-dudes? They knew the world was going to end - but they rescued a few children to save humanity from a complete extinction. Was that part of the deterministic universe or does determinism break-down at some level? This is where things get interesting. Have they been able to predict those things because of their scientific or divine knowledge. The answer will depend upon whether you consider them aliens or angels. a) Close to the end of the film, the scientist warns his father to go to the shelter to protect him and his wife from a potentially deadly solar flare. The father refuses to take any precautionary measure. He believes that if this is his time to go - then he will go. No point in hiding. Absolute faith and a fatalistic approach. On the other hand, his son tries to do everything - but ultimately all his efforts fail and reveal his helplessness in the face of an unforgiving nature. Depending on your perspective, you can defend each side and it leaves the issue more or less inconclusive. b) Then there is an exchange at the very end of the movie. Right before the Earth is incinerated by a mega-solar flare (did I say cool!! ), the father says "Everything will be fine". The son replies, "I know, everything will be fine". This is interesting because father's statement is coming out of complete faith. But the Nicholas Cage character knows that his son (and also humanity) in the end will be fine. The world is ending, but few humans will survive the catastrophe. But his answer is coming from actual knowledge of this. He has seen the aliens take his kid on a spaceship. Between father and son, there is a distinction between what they think they know. Which mode is better? In this context, I think the film tips it in the direction of science - ever so lightly. But I'm sure others will interpret it differently. By the way, if you like intelligent end-of-the-world movies, check out Last Night. This was a small Canadian film that came out in 1998. It asks the question: If you know the world is really going to end (it doesn't matter how), and everyone has known that for a year, how will you (as an intelligent person) spend your last night? Good stuff. 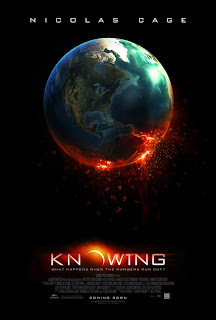 One comment on the mode of Earth's annihilation in Knowing: The world gets destroyed by rare super solar flare. I doubt that such a flare is possible at this stage of the Sun. But in a few billion years (oh - I'm already preparing for this) our Sun will become a red giant and then its surface will get much closer to the Earth. Then, solar flares will start effecting the planet directly. But by then, oceans would have already evaporated because of increased heat, and so humans would have already migrated to the Delta Quadrant (oh--I'm such a geek). In any case, give Knowing a shot. Thanks for the review ... I'll prolly go check it out when it comes out on Itunes. I never bought into the view that religion and science are "competing was of knowing." I see science as the objective study of the universe and religion as our subjective response to it. I also never bought into the idea of free will and determinism as incompatible. Determinism is an unfalsifiable hypothesis about the nature of the universe. Free-will (within limits) is our undeniable subjective experience in that universe. Thanks for the heads-up for "Knowing". I'll definitely put it on my list of films to see. "Dark City" is one of my favourites, and even "I Robot" had a certain style (even if it shared nothing else in common with Asimov's writings). "Knowing" sounds as though it's a film to be appreciated alongside of "Contact". I see science as the objective study of the universe and religion as our subjective response to it. This may be correct - but these boundaries are often crossed. From the perspective of this movie, the different responses to a coming catastrophe provides the contrast. The same has been seen in the context of earthquakes, Tsunamis, hurricanes, etc. Are these part of a God's plan? Should humans interfere with to change these plans? What if all is written to begin with? Obviously the answers are different for different people. It doesn't have to be the case, but one can see the potentials of clashing worldviews here. Geoff: "Knowing" sounds as though it's a film to be appreciated alongside of "Contact". Ah. Yes, Contact is one of the movies I really appreciate. There are certainly some common themes in the two films. But the mood and atmosphere of the "Knowing" more resembled that of Derren Aronofsky's films: "Pi" and "The Fountain" - especially the latter. Perhaps its because of the somber, mystical, and a fatalistic tone of these films that make them different from say "Contact" - which is more about the active ability to change things. Interestingly, Alex Proyas also directed the beautiful "The Crow". Again, that fits in nicely with the dark, somber, fatalistic overtones of his (and Aronofsky's) movies. When you see the movie, let me know if you categorize Knowing with Contact/2001 or in some other direction. I guess i'd say, science tells us only whether a tsunami is coming or not. Religion is our response to that -- do we adopt a religion of self-reliance and take steps to survive, or do we adopt a religion of fatalism and say "Insh'Allah ..." Science has nothing to say about what we decide to do -- it speaks only to the naked facts of reality. Our response to those facts is determined by our values, which (in my opinion) define our religion. Fatalism and theism are often conflated, but I don't think that's right. One can believe one has both a creator and self-determination just as easily as one can believe one has a father and responsibility for one's own life. ungtss I agree very much with your insight on the idea of religion being our response to science/facts. The question i want answered is, since our religion is only a response, what is the right answer/response if there is one? In your opinion of course. Well, I don't know if there's a "right one" in the sense that every person should have the same response ... after all, each of us has a different view of the universe, and so is bound to respond differently. A rich European aristocrat is going to see a different world than a slummer in Rio. If they responded the same way I'd think something was amiss. The first is humility -- recognizing that the universe is much larger and more complex than ourselves and that our knowledge and significance is very very limited. The second is justice -- recognizing that treating others as we would be treated is fundamental to human interaction. The third is curiosity -- seeking to expand and improve our understanding, so as to grow in wisdom. The fourth is faith -- and by faith I don't mean "believing without evidence" -- I mean being steadfast in what we know to be true, even in hardship.